In 1860 Michael Gross [sic], Iron Founder was described as follows in the U. S. Census, Non-Population Schedules for Industry: Capital invested $15,000, materials on hand 100 tons of wrought iron valued at $5000, 600 tons of cast iron valued at $30,000, and coal valued at $2500. The average number of hands employed was 20, and the average monthly cost of labor was $800. The total value of the prior year's production of "iron work for buildings" was $60,000. In the same year the New York Times, 9 Feb 1860, writing in regard to Trow's new printing office on Greene St. stated, "The building and all throughout has been strongly fastened and anchored, and all the iron is of the very best material, and done in the most workmanlike and strongest manner, as the books of Michael Grosz will bear testimony, as he furnished all in the iron department." Michael Grosz, smith and whitesmith, was located at 43-45 Greene St. at least as early as 1841. His son, Frederick H. Grosz (1833-1878), appears in city directories in 1856. 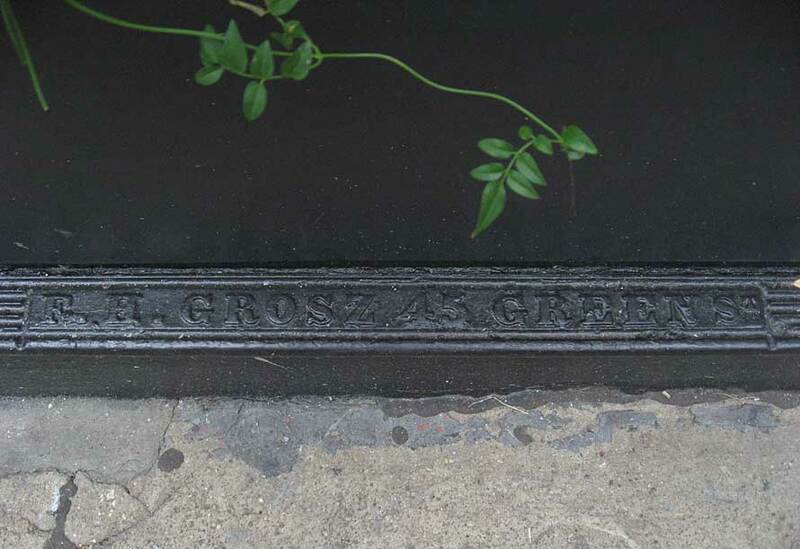 The firm name Michael Grosz & Son appears from 1865 through 1880. In 1879 the business was described as manufacturers of "stable fixtures and all kinds of cast iron work, iron railings, window shutters, gratings, bank doors, illuminating tiles, iron fronts, rolling shutters and vault covers." Both Michael Grosz and Frederick H. Grosz were assessed income taxes during the Civil War. In 1863 Frederick Grosz was taxed $115.74 on an income of $3791 and 67 ounces of silver plate. In 1865 Michael Grosz's assessment was $756.65 on an income of $9803, two watches and 67 ounces of silver plate. In that same year Frederick H. Grosz paid $685.75 on an income of $8994, two watches, a piano, and 67 ounces of silver plate. Frederick H. Grosz died in 1878. The city directory entries for 1880 listed Marie F. Grosz, widow of Frederick H., and Michael Grosz & Son was designated "estate of."